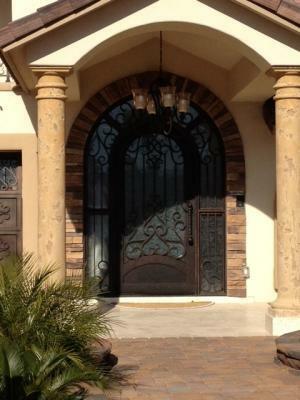 This beautiful iron entry door is a recent install in Phoenix, AZ. This arched single iron door has both sidelights and an arched transom with ornate iron work that compliments the patterned glass windows. This iron door has rejuvenated this home and given it a fresh new look with a simple door replacement. Now to take this look a step farther we can match custom iron garage doors and exterior ornamental railing to this entry door and transform this house into the gem of the block. Your door is the first thing, not only your guests see, but what you see as well when you first arrive at home. You door is your first impression to onlookers, neighbors and guests. Let us create a lasting first impression for you with a beautiful one of a kind custom iron entry door. Signature Iron doors is proud of our product quality and customer service and we invite you to take a look at our website and contact us to see how we can fulfill you iron needs.